It seemed like a good idea at the time, right? We’d build vast, multi-lane roads slicing through the center of our cities, bulldozing our most historic architecture and displacing tens of thousands of residents at a time, all in the name of progress. 50 years later these genius improvements have severed our neighborhoods, ruined our air, and may not even have helped that much in the way of traffic. 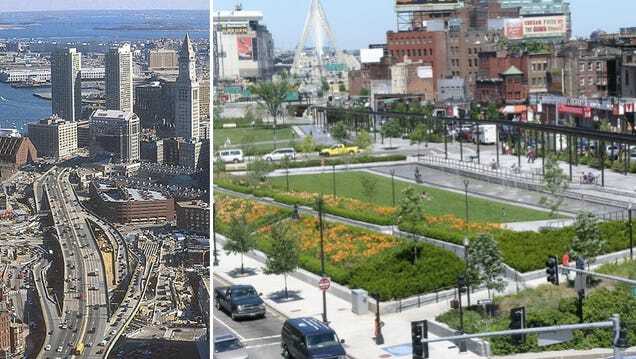 So why have a freeway exposed like a gaping, oozing urban wound when you can put a park on it? Freeway cap parks (or highway cap parks, or turnpike cap parks, depending on your preferred regional dialect and/or toll system) are the hot new way for cities to dial down the noise, pollution and blight that come with those pesky interstates. Facing rapidly growing populations as more people move back into urban areas, many cities across the country are looking at them as a way to quickly reclaim valuable public space. It’s not a new idea, of course. 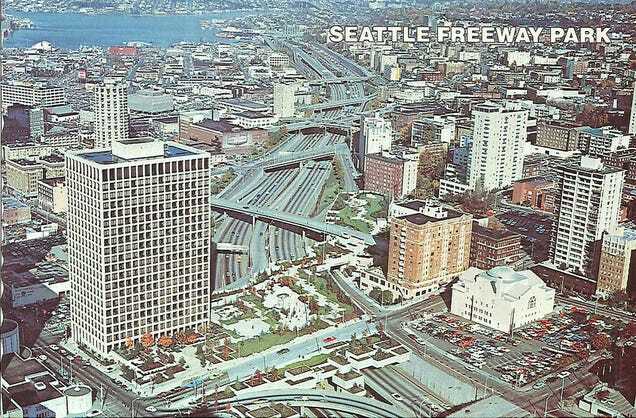 Freeway cap parks have been around for as long as freeways. Technically, the Brooklyn Heights Promenade, where the BQE tucks under a pedestrian walkway, is a freeway cap dating to the 1950s. Seattle’s too-aptly-named Freeway Park (above) was constructed in 1976 as a Brutalist wonderland where the sound of waterfalls (almost) drown out the 5 Freeway below. In Phoenix, the 10 Freeway was routed into a tunnel when it was built in 1990 and Margaret T. Hance Park was built on top. But freeway caps have come a long way in the last 2o years. 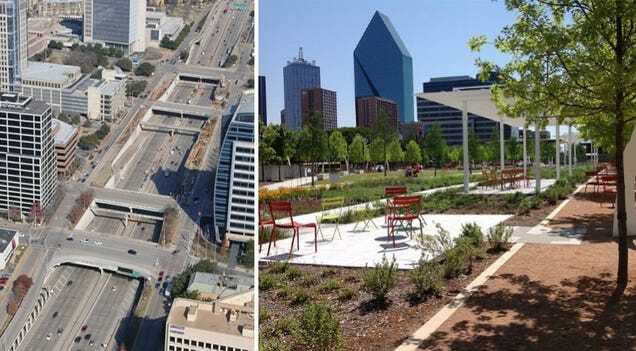 Capping, or adding “decking” to the freeway, can be more time- and cost-effective than other redevelopment plans (Dallas built theirs in only two years) and may be eligible for federal transportation money. And because they’re located in already densely populated areas, many of these parks aren’t just covering eight-lane eyesores, they’re offering amenities like farmers markets, cultural programming, transit connections and bike facilities right where neighborhoods need them most. Not to mention the feel-good social impact of reuniting communities that were torn apart 50 years ago. Below, some of the newest and most notable freeway cap parks to open in the U.S., and a few on the horizon. 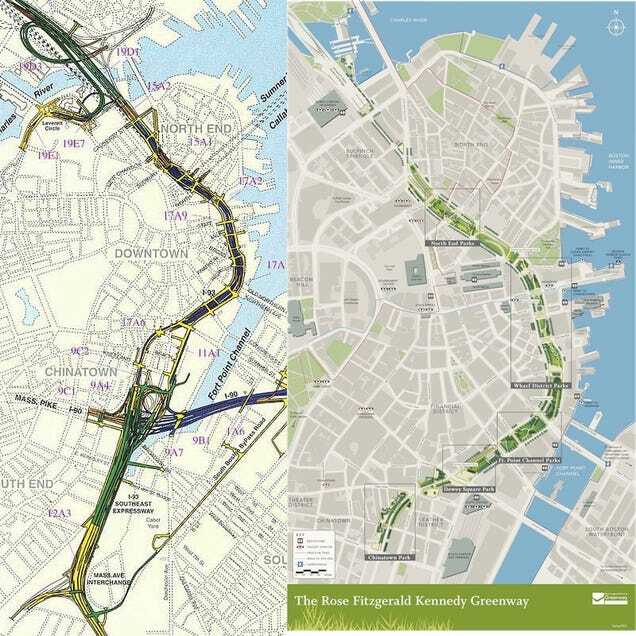 The infamous Big Dig project that relocated several freeways underground resulted in the Rose F. Kennedy Greenway, which opened in phases beginning in 2008. The 1.5 mile, 15-acre ribbon includes five parks, including a brand-new carousel. Five acres over the Woodall Rodgers Freeway were reclaimed late last year when the Klyde Warren Park opened in downtown Dallas. The slender park offers fountains, dog runs, a game area, and a $3 million annual operating budget for programming. 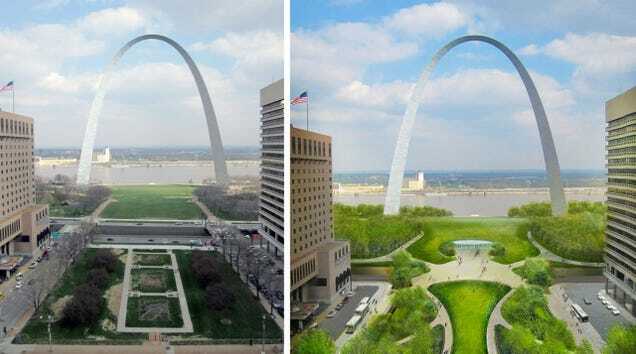 Ground broke last month on this park over Interstate 70 as part of CityArchRiver 2015, a $380 million renovation of the Gateway Arch and riverfront. It’s not a huge park (basically a block) but it will pack a big punch by connecting the Arch’s grounds with the rest of the city. The city that you might say invented the freeway has two proposals on the 101 Freeway alone. 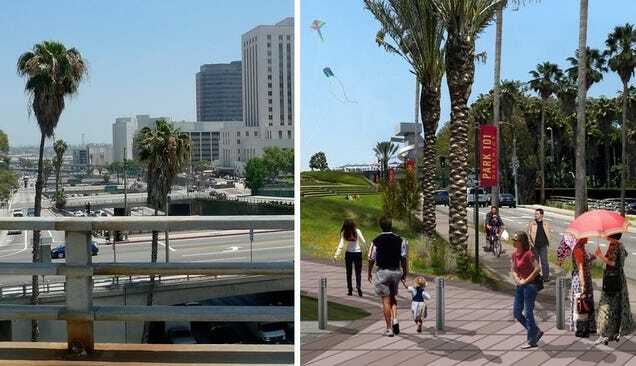 In downtown, Park 101 (top image) would connect Union Station and the historic center of L.A. with the Civic Center and rest of downtown across the freeway. 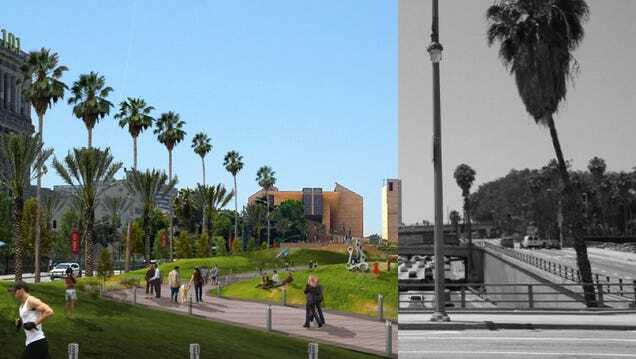 A few miles away, Hollywood Central Park is a 44-acre proposal to green the gash through mostly residential neighborhoods just east of the Hollywood business district. Both proposals are currently approved by the city to seek funding. 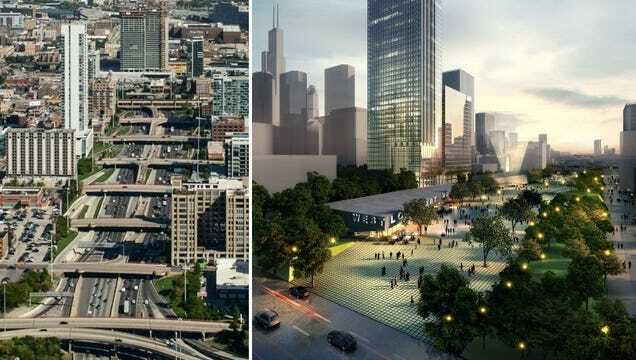 Chicago’s Central Area Action Plan has long advocated for a freeway cap, but a new proposal called the New West Loop would cover three blocks of the Kennedy Expressway to create not only a park but a new hub of office buildings for tech firms to occupy.